Fix common aquarium problems such as green water, cloudy water, and algae growth by eliminating the cause rather then treating the symptoms. There are some pitfalls most seasoned aquarium owners have experienced at one time or another. One very common pitfall is the battle for clear aquarium water. Cloudy water, green water, and algae growth can and likely will just pop up at one time or another. What we do next often determines our ‘happiness factor’ for keeping fish. Many common aquarium problems are caused because of a chemical or biological imbalance of the water. When the appearance of the aquarium degrades, nitrate is usually to blame. While nitrate isn’t visible to the eye, its effects are. When nitrate rises, maintaining clear aquarium water becomes a challenge. High nitrate usually results in green aquarium water and unwanted algae growth. Nitrate is an ion absorbed by plants. It is a main ingredient in common plant fertilizers. In the aquarium nitrate will be utilized by algae as a vital food source, prompting its growth. The primary purpose of water changes is to remove nitrate from the aquarium. However, each water change only removes a limited amount of nitrate, while its accumulation is persistent and ongoing. Change water too often, or change too much and the problem can get worse. Chemical aquarium products often are harmful. While they offer some temporary results, most of these products only mask the problem by treating the symptom instead of the cause. Once the active ingredients wear off, the problems reoccur. Additionally, chemical treatments can have significant side effects, creating the “need” for additional products and supplements. ALGONE is the perfect filter supplement. Unlike chemical treatments, ALGONE treats the actual cause which threatens water clarity, and the overall visual appeal of the aquarium. Cloudy aquarium water, green aquarium water, and algae growth are symptoms of a biological imbalance of the water. They should not be treated as the problem itself. Rather, they should be viewed as an indicator of a biological imbalance of the aquarium water. ALGONE goes to the root cause of these problems. It’s important to note, ALGONE is not an algaecide and has no direct effect on algae itself. 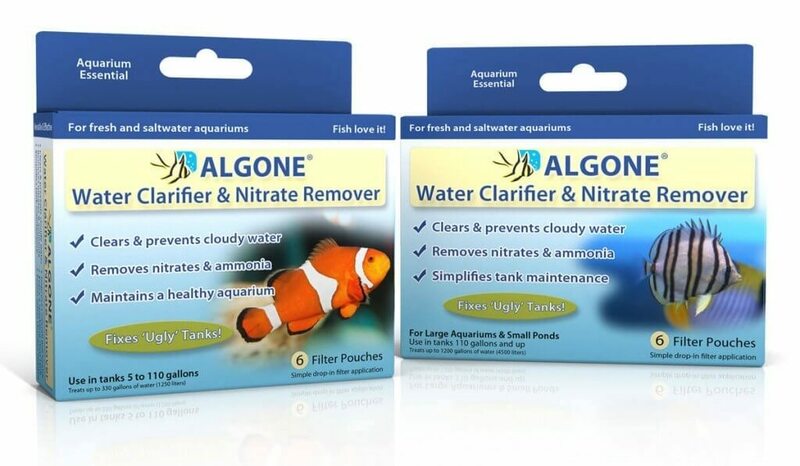 Adding ALGONE to the aquarium’s filter continuously removes nitrate in between water changes. The benefit is a crystal clear and balanced aquarium. Because Algone is all-natural and chemical free, it is safe and gentle for use in all types of aquariums. Use Algone in freshwater, saltwater, reef, and panted aquariums. I am currently using sponge filter system…how does this product work with them as it says to place in filter system? When no filter is available, the Algone pouch should be placed directly inside the aquarium (unopened). A veggie clip is a great way to secure the pouch directly to the glass for example. This is outlined in the included instructions. It’s best to place the pouch near maximum water flow, i.E. near a power head or any other filter return. Yes, absolutely. Algone is a filter supplement that can be used to solve high nitrate & ammonia problems, as well as clear cloudy water. Using Algone every 2 – 4 weeks helps prevent many aquarium problems related to poor water quality. Does anyone know if using Algone in a fresh water aquariums influence the function or the well being of beneficial bacteria in the filter in any way? Algone will not negatively affect the beneficial bacteria. From where i can get algone?? Use this link to order Algone. You can also check your local pet store or search the internet for more Algone outlets.